Poured into a small tulip glass jet black with a thinner khaki colored head atop,it just looked menacing...in a good way.Roasted nuts play a big role in the nose along with bitter chocolate,and vanilla/oak.Low carbonation and a fuller chewey feel is nearly spot on for this beer,just great for slower sipping.Flavors are rich with roasted nuts and bourbon notes but not over the top,chocolate and alcohol dipped dark fruit in the finish.I really liked this beer,rich but not over the top with the barrel. 12 ounce bottle - $3.79 at Total Wine & More in Kennesaw, Georgia. Appearance: Pours a black body with a medium-sized, dark tan-hued head. Smell: Charred nuts, well-roasted malts, cocoa powder, and moist dark fruits wrapped in strapping bourbon barrel notes -- some beers gains the soft, more ingratiating qualities, this beer took on the more hostile elements. Taste: Accelerated roastiness, coffee hinting, for sure, with touches of burnt nuts. It's a tad astringent but soothed somewhat by the cocoa qualities and some apparent sweetness. Vibrantly raisiny. The barrel character is definitely there, lending some firm barrel notes with a rugged woodiness. Drying, roasty, wood barrel finish. Overall: Sharp roast, with a strong alcohol warmth - it's a little rough around the edges, but, it's still enjoyable. On-tap at Oblivion in Orlando. Pours a deep dark black color with a thin tan head. The aroma is sweet chocolate, roasted malts, vanilla and some notes from the bourbon barrels. The taste is sweet and roasted malts up front with vanilla and a lingering warm and boozy finish. The mouthfeel is medium bodied with a good amount of carbonation. Overall, I feel like this one can definitely need it from some aging. It is just a little too hot at this point for me, needs to mellow out a little. Thanks to dogdoc for hooking me up with this one in our recent trade. Reviewed from notes. Poured from 12 oz. bottle into a Cigar City snifter. A: Very dark brown, essentially opaque. Forms a thin tan head that fades quickly and low visible carbonation. S: Oaky vanilla, milder bourbon, some chocolatey malts, sweet dark cacao, and dry woody tannins. T: Roasted malts, vanilla and cacao in balance, tannins from the oak, some muted bourbon, and mild dark fruits - almost more candied fruit peel. Sweet maltiness with mild roast bitterness and a bit of bourbon burn in the hang. M: Silky smooth mouthfeel but the body is on the light side. Low alcohol heat, especially for style, and moderate alcohol presence. O: This was a good beer, but not mind-blowing. It didn't have the chewy, thick mouthfeel I'd expect, and there isn't a whole lot of bourbon flavor or heat. Certainly not a beer for someone who prefers a heavy-handed approach to barrel-aging. I had heard enough good things I had high expectations, and it didn't live up to those. I'm still happy to have tried it, but this falls quite short of the best barrel-aged stouts. Pours pitch black with a very tiny dark tan head. Some moderate lacing. Aroma has lots of char, vanilla, and bourbon, of course, along with notes of caramel and toffee. Nice but not especially impressive. The flavor is very similar to the nose. Tons of bourbon up front with the vanilla and smoke that goes along with it along with some sweet caramel. Very full and sticky mouthfeel with just a light touch of bitterness. Overall, an ok bourbon stout but nothing that really makes it stand out from the many others out there. 12oz bottle purchased at Hop City, Atlanta. A - Pours a thick, jet-black with a minimal mocha head that quickly recedes. Decent lacing. S - Not getting much. Minimal chocolate and roast, barely getting any booze or oak. I do get some dark fruits as the beer warms. T - There's a slightly harsh, roasted bitterness, followed by a bit of booze. Chocolate. M - Medium to light body, very carbonated. Not as smooth or full bodied as I would have liked. O - This is an OK barrel-aged imperial stout. It's not bad, per se, it's just underwhelming and the harsh roasted notes and booze seem to take over. I really wanted to to love this beer, especially considering the Buffalo Trace barrels Red Brick used, but it's just not drawing me back for more. I'll certainly put some aside to see if time in the cellar will mellow it out and let the flavors meld together. 12 oz. The usual black pour, thin layer of tan head. Some minimal lacing. Aroma, Chocolate, caramel and some barrel induced vanilla. Taste, Light roast malt, chocolates, toffee. Some vanilla. Big woody oak component. Finishes a little drier, some cocoa coffee and anise. Near full body. Carbonation a little more than creamy. Alcohol well in check. A real nice blend of barrel and base beer. Not a barrel bomb, but a well done treatment. O: I seem to get a cheap bakers powder cocoa from every stout this brewery does. the beers are not bad, just not that complex. A: Pours pitch black with one finger of dense tan foam. Retention is good, lacing is very good. S: Oatmeal, milk chocolate, and toffee mix in almost equal amounts in this beer. I also get some dark chocolate, but there is certainly not a bitter quality to it. Bourbon is way in the background, but seems to round out the flavors quite nicely. T: Oatmeal and chocolate take center stage here. It really reminds me of an oatmeal chocolate chip cookie. Toffee is still there adding to the sweetness, but there is certainly more bitterness and less sweetness than I got in the aroma. The chocolate comes out as more of a mixture of milk and dark chocolate here, though I'm sure much of this is perception due to the bitterness. Fairly boozy. M: Medium thickness for the style with very creamy carbonation. O: Impressive. This is not over the top, not overly complex, but is well balanced and well put together. I could use a bit more malt complexity, but I really like this. Had never heard of this brewery and added a few of these as a "throw in" to my Letspour beer order. Glad I did! Pours a jet black silky smooth colored ale and a very nice beige/brown head with staying power. Lacing is light. The aroma is outstanding. Vanilla and chocolate swirl here. I could whiff this all day. Light apple/orange though I believe this is from the bourbon barrel shining through. The wood/barrel is present as well. Really aromatic. The taste is great as well. Follows suit with the aroma. Slightly hoppy and a kiss of bourbon burn. Chocolate dessert here. Coffee beans. More vanilla. Just a really, really good blend of flavors here. Slight warmth in the tum-tum. Nice bourbon/chocolate on the aftertaste. The mouthfeel is oily as I was expecting but in a good way. Overall this met and exceeded my expectations. Just a great barrel aged stout with great drinkability and full of flavor. Not too sweet...not too bitter. The barrel is not overpowering. 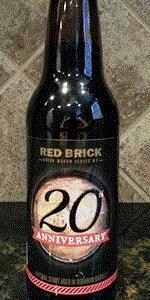 A great way to celebrate your 20th Anny Red Brick. And to think I never heard of em. Distribute to Cali damnit! And keep brewing these barrel aged all-stars. You nailed it!